Spring is (almost) here! That means it's wedding season, and whether you're a bride-to-be, forever a bridesmaid, or an invited guest, Modcloth has a ton of awesome options for you at (gasp!) affordable prices! You're cordially invited to explore ModCloth's exquisite wedding collection! Fall in love with dreamy dresses and outfit finishers perfect for brides, bridesmaids, and attendees eager to express their unique perspective on style. And don't forget -- we want to see the fab ModCloth look you put together! Use #marriedinmodcloth to share your inspiring ensemble with the rest of the ModCloth community. 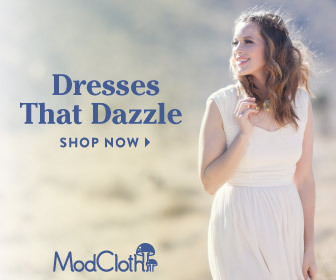 Of course you can find lots of super cute white and off-white dresses that are affordable and perfect for your wedding... but did you know that ModCloth has lots of non-traditional (read: not white) dresses that are also perfect for a wedding? As a red wedding dress wearer, I'm all about non-traditional themes! This black and white scheme (especially the shoes!) totally reminds me of Las Vegas last summer, when Todd and I renewed our wedding vows for our 5th anniversary via an Elvis ceremony!